Friday February 10th 1899 The weather was enough better that Will took up the butter this morning. I was hardly out of the house all day. Will told when he came home that Hattie was kept in her room by illness and that Mother had about all she could manage with only the help of the little girl. The old house has never been so cold. all Mothers plants are froze. Saturday, February 11th 1899 Today has been about like Wednesday. It is just all we can do to keep things from freezing I cannot say when we have had so long a cold spell. I worked on my spread a little. 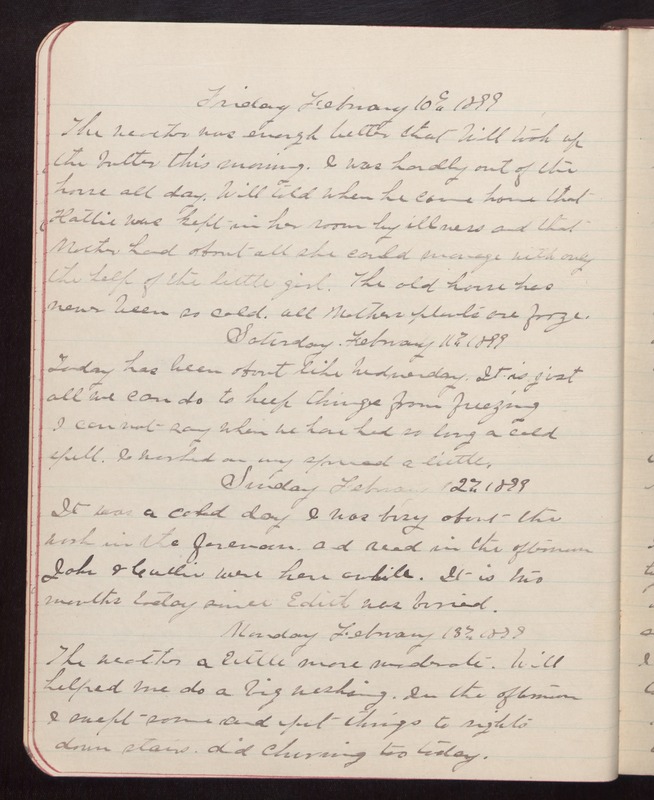 Sunday February 12th 1899 It was a cold day I was busy about the work in the forenoon, and read in the afternoon John & Callie were here awhile. It is two months today since Edith was buried. Monday February 13th 1899 The weather a little more moderate. Will helped me do a big washing. In the afternoon I swept some and put things to rights down stairs. did churning too today.